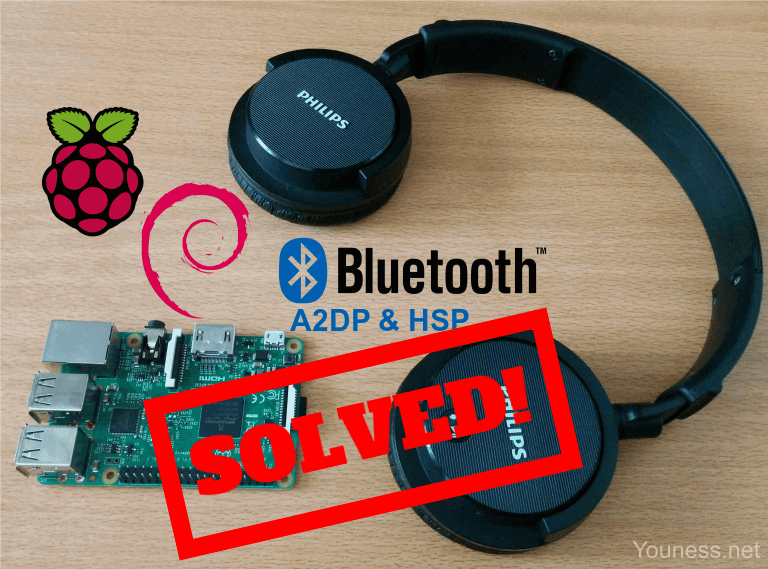 In this post, I’ll share with you the final solution that lets you connect your Bluetooth headset or speaker to Raspberry Pi 3. You’ll be able to use both output speaker and input microphone. Drop-out of ALSA support in Bluez v5 (replaced by PulseAudio). Unavailability of correct PulseAudio version for Raspbian Jessie. Incorrect audio rooting SCO-HCI for the Bluetooth chip BCM43438. In my previous posts, I solved the issues 1 and 2, but I couldn’t find a good solution for 3. For issues 1 and 2, I found how to install manually PulseAudio, with code sources, or using Debian backports. For issue 3, I used a BT-USB dongle that bypassed the internal Bluetooth chip and let me use A2DP and HSP profiles. So the main problem wasn’t resolved, HSP that supports audio input wasn’t OK using the combo Wi-Fi/Bluetooth BCM43438. It took me a very long time to eliminate suspected parts one by one, and come up with the conclusion that we can’t do much more without the support of hardware suppliers. I contacted them but with no success. Install latest PulseAudio version for Raspbian Stretch. Re-route SCO Bluetooth audio using vendor command. Power ON Raspberry Pi, set up internet connection, SSH, …etc. The update may take some time. With Raspbian Stretch, PulseAudio is no more installed by default, they are now using Bluez-alsa. At the same time, PulseAudio in the repository has now native support of both A2DP and HSP. Installed version is 10.0. I remind that we need PulseAudio v6 or higher. The same steps like in my previous tutorials using bluetoothctl. Turn ON the headset, for mine I press and hold the button till I see white LED blinking + earcon. At this step, you should have you device successfully connected to Raspberry Pi. Now let’s check that A2DP streaming is working. Now we will check for HSP profile. This is a vendor-specific hexadecimal command, that changes the Broadcom (or Cypress) BCM43438 configuration. Failed to set card profile to ‘headset_head_unit’. So I rebooted, removed the Bluetooth device and started again from the pairing step. I can’t tell your what was the problem, but I’m used to this kind of instabilities, just try again. If you play an audio sound, you will notice the mono quality of headset audio. Please post a comment if you have any question or suggestion. To improve the tutorial, auto switch to Bluetooth after connection, and disable idle module. To use bluez-alsa instead of PulseAudio, since it is by default in Raspbian Stretch. To add the command in next Raspbian release? I set the hcitool but I don’t know what ’s for. Any suggestion will be readen attentivily. Your speaker has only a2dp_sink so you can only use it to stream audio, I searched for Bose SLIII and I didn’t find that it has an internal microphone. Tried your instructions but cannot get set profile and sink. Errors on each. I have a headphone unit working well on a2dp but have been unable to get speaker working. When trying the speaker it pairs and connects but there is no card listed for the unit. As a sidenote….i tried a completely clean system (using stretch) and couldn’t get either unit to output sound. Headphones pair and connect and show as card1 but have been unable to activate profile. Speaker pairs and connects but do not even show as card. I have been reading all your efforts and will continue to monitor your site. Thanks for all your hard work. Your devices work for other PC oh smartphone? Do they need any specific step like insert a pin code (0000)… Etc? What if you try to set profile to “off” before setting it to another profile, sometimes this works. Did you stop bluealsa? If not maybe it takes your Bluetooth card and doesn’t let PulseAudio list it. Don’t give up I’m sure we can make it work. Hi Youness, didn’t expect such a quick reply…..thanks. Buth units work well with android and ios hardware. I did turn off bluesalsa and noticed that the profile was turned off in pavuaudio so i rebooted and turned the profile on. I will be busy with other things today but will try to capture some info when i get a chance. Seems like all works well in your guide until I check cards as explained above. And seems odd that i can get a card for the headphones and can connect bit cannot get audio to output. Both units appear to suppory a2dp and hfp. I recommend you to do everything in command line, I can’t guarantee that GUI tools are updated and fully support PulseAudio and Bluez. For your information, I’m doing everything by SSH so I never use an interface to configure Bluetooth, maybe this detail hide some errors on your side. I thought I’d highjack the comment section of your post, Youness, and ask for help in a similar setup I’m trying to get working: In my case I have an USB audio interface with in- and outputs connected to a Raspberry Pi Zero. I want the Pi to connect to another device (pc, ipad…) registering as a bluetooth headset (using hsp). So far following a mixture of your tutorial and this link (https://didier.io/post/raspberrypi-stream-sound-over-bluetooth) I managed to configure the pi as a bluetooth speaker. But I can not get it to send the microphone input of the audio-interface over bluetooth… Any ideas? I tried different values for the Class parameter in /etc/bluetooth/main.conf .. So far without success. Any help or ideas would be greatly appreciated! Did you tried the module-loopback? With that you can route a source to a sink. If I get your problem, you want that the Raspberry Pi Zero W receive the Bluetooth microphone and sends it to another device? now it’s running nearly well. Is the main progress would be stop the bluealsa service in console? I’ll try later, for instance I listen with pleasure. As I said before I don’t use GUI because I already had some problems and they don’t implement latest changes of PulseAudio and Bluez. Also bluealsa is started by default so we need to kill it before. I think that it is now OK for you, as reported by someone here, the reconnnection of Bluetooth is done with no additional command. I try to restart but nothing for instance. Save it with CTRL & X, then Y, then ENTER. Try that, if it works we can check to automate Bluetooth connection. Thank you! This has been frustrating me for the last two weeks! But, I still seem to get that error every time. I’ve tried a couple of things I found digging through some old forum posts, but nothing seems to fix the problem. The profile headset_head_unit does appear in the listed profiles, but I can’t set it as the active profile for some reason, I can set it to a2dp and off however. Could it possibly be because the listed protocol is (HSP/HFP) as opposed to being solely HSP? Thanks for any help and for all the effort you’ve put into solving this problem so far! Your device should support HSP just like mine from what I see in the logs. Did you try to just re-connect it? Or you completely remove it and pair it again? Do a complete remove and pair again, this kind of bugs in random and many reasons can lead to it. Also, did you connect it to a PC for example to check that there is no additional steps, like entering PIN code or something like that? However, I am able to switch the card profile and default-sink to a2dp_sink and play the audio file. But again when I try to switch the profile to headset_head_unit it fails with the above error. Oops! We seem to have posted replies simultaneously. So, I just tried connecting it to my computer and managed to both play and record audio when it’s connected. I’ve also just tried this on my phone and managed to do the same, both without requiring a passcode or any authentication step. The device simply connects. What I’ve tried in terms of removing the device is to open bluetoothctl and remove the device from there. Is this what you’re referring to? Yes that’s it. Remove and pair again solved my bug. I’ve tried this multiple times and it doesn’t seem to be solving the issue for me. Here’s what I’m doing step by step, also FYI I’m using a Raspberry PI Zero W with Raspbian Stretch Lite. 5. Exit bluetoothctl (I’ve also tried this by not exiting, but instead opening a second SSH connection). 10. Set up a2dp, download the file and play the ogg file. The device plays the audio file perfectly. And I then receive the same error again. Repeat and I get the error again? 6- I think that Stretch lite comes with not audio manager for lightweight distro, that’s maybe why it reports no process found. 12- You try to switch to “off” between ad2p_sink and headset_head_unit? Do you have a Raspberry Pi 3? | 12- You try to switch to “off” between ad2p_sink and headset_head_unit? I’m able to actively switch between off and ad2p_sink, but not between off and headset_head_unit or a2dp_sink and headset_head_unit. | Do you have a Raspberry Pi 3? Yes, I’m going to try using Raspain Stretch with the GUI rather than Strech Lite. If that fails I’ll try my Model 3 B+ and see if I get the same issue, if not at least we know whether the problem lies in Stretch Lite or the Zero W’s hardware design. Thank you too for letting us know about the results of your tests. I’m facing exactly the same issue than Connor. Setup of a2dp and sound tests run perfectly. I found interesting input on another forum https://bbs.archlinux.org/viewtopic.php?id=209979. It seems to be linked with the fact that pulseaudio does support HSP but not HFP. @Connor, I assume that if you run info in bluetoothctl, you’ll find that your device is HFP..
I’ll try anyway but I’m sharing the link in case you manage to apply that fix and share a rookie-proof description of the solution. HSP and HFP are two different profiles. We mention them together because HFP is an HSP (audio) plus some AT commands to take the call, end it,…etc. PulseAudio since version 6 supports HSP natively, while HFP requires additional support like oFono (that I never used). Back to your problem, I don’t think that the problem is that you have only HFP, unless you have a headset dedicated to calls (I mean, you should have a green button to take a call, a red button to end it…), I think that you have HSP profile but you went into random bug that we all had, and that each one resolved by a mysterious solution like reboot the Raspberry Pi, remove and pair again the headset, try to switch to profile off, …etc. I tried many reboots / switchs to all profiles / praied a lot.. with no success. However, I tried with another device, which could switch to headset_head_unit profile at the 1st try. ..Only issue is that the sound has a terrible metalic noise. I might not be able to perform the NLP tests that I initialy had in mind. Thanks anyway for your great contribution to my project. Try to adjust the input level (pavucontrol maybe? ), and turn off WiFi because it impacts the Bluetooth streaming. GDBus.Error:org.bluez.Error.NotReady: Ressource Not Ready. Try to connect again.. But I tried for one and half hour. if I use the wire between the jack connector’pi and the bose’jack, I got audible music. Do you know how we could get the bose-bluetooth line in the output-pavucontrol as soon as we have connected bose in the audio icon and in the bluetooth icon on the taskbar? Thanks a lot for any response. I’ll try to do a script like that in the weekend. I tried putting the created script in rc.local as well as the location you suggested, doesn’t make a difference. I can’t connect after a reboot. Thanks for this article. I actually had this working “right out of the box”, which makes the problems even more annoying. I had jessie running, and the only thing I did was to bluetoothctl pair and connect my Bluetooth speaker, and it connected, and STAYED connected. I could play mp3s of the command line, and use text-to-speech which was part of the project. Then suddenly, while testing, the audio stuck and repeated (broken record, extremely fast), and I had to turn off the Bluetooth speaker. Since then, I have not been able to pair again using the default alsa. I since upraded to stretch, it only worked using pulseaudio, but sound is very choppy. It sure would have been nice to have a simple and working A2DP and HSP. I’m not sure how did you do to make it in Jessie with ALSA, for me the possible way it to use bluealsa in Stretch. Are you familiar with that? You can set up a config file then your speaker will work all the time in A2DP using bluealsa. I’m writing a post for bluealsa, but I need more time to test it. That will be great! It’s best to use the standard libraries, I guess. You are probably right, it must have been with pulseaudio. I had a 6 month break from my project, so I can’t really remember how it was set up. But I find it strange how Bluetooth audio worked perfectly, and then suddenly, out of the blue (tooth ;)) it stopped working, even connecting didn’t work. Well, I don’t know how did you upgraded from Jessie to Stretch, but I think that now bluealsa is started by default and that is what blocked your Bluetooth. Try this command: sudo killall bluealsa, if it works it means bluealsa is taking place of PulseAudio, so follow the post to get back your PulseAudio A2DP. Ok, and PulseAudio is started? The bose is now running, how? using what you say by console. I uninstall bluealsa… may be a bad idea for another app? scan on sees the bose in some seconds, pair, trust and connect even if we havn’t answers «on» with pair and trust, connect has to get connected in any case. If we start pulseaudio in console, the streaming flow is bad because the console prints out the levels of the streaming and creates interruptions. Running good for 3 hours, fine! The dream! For me, an improvement in order to click on something once would be better for start recognition and real connection of the bose. I can wait now I learned the console steps. Bye! Pleasure to meet you! Dear Youness, first of all i want to express my gratitude for sharing your knowledge/time with us. i have read all your project since the begin and applied to my situation. i would like to automate the connection after reboot , and i saw some indication that you suggested and i’ll try to applicate. what is not very clear to me is what in the procedure is permanent and what must be automated at reboot. i try to explane my project that is now in the first step and maybe i’ll get some suggestion. we are a group of motorcycle bikers, we ride in goup and we all have bluetooth devices in the helmets connected to the smartphone and some of us are also connected in intercom from bike to bike. the range of the bluetooth in certain condition is not enough so we want to use rtx radios (uhf/pmr). The project is to connect a common two way radio with the the bluetooth installed in the helmet. the idea is to connect via bluetooth a raspberry to the interphone (done, to be automated) and than to physically connect the raspberry (probably wit an extra audio dongle) to the mic/spk connector of the radio. when i am talking into the Helmet’s microphone, the audio should exit from a connector and enter in the mic connector of the radio. what the radio receive a signal, the audio getting out from the spk connector should enter in the raspberry and streamed into the helmet. I think this is enough, if you do that, just after turning ON the headset it will be connected to the Raspberry Pi. The command hcitool is done one time. For your project, you can connect a wired USB card, that has two jack for microphone and speaker, is that OK for you? Then, you route the sinks and sources from USB card to Bluetooth card. It is just a proposal I didn’t do it, so try it and check for other solutions too. I’ll give a try for a script automating steps this weekend, I’ll then send you any update. First of all I’d like to thank you for your work! Did you have time to try to make a script to automate these steps? I just bought an asus bluetooth module, and plan to try your instructions to install it, thanks. Why you want to disable internal Bluetooth? The aim of post is to not use external Bluetooth dongle, but if you purchased one, yes I recommend you to use it as you will have better audio quality than internal Bluetooth. The internal bluetooth on a pi3 or pi zero w can interfere with the internal wifi. When I had both enabled, I would get stuttering in the sound, quite annoying. If you use either an external bluetooth or external wifi, problem goes away. I think its a bluetooth driver issue. Yes that’s what I’m telling people when they come with audio bad quality, it worth to take external Bluetooth for the moment. Yes, I have the same issue with distorted audio. I believe the problem may be caused by a sample format mismatch. I can hear it when I loopback the audio. What exactly is the following command in the final solution supposed to do? Is there a byte-for-byte breakdown? Is the sample format encoded in there somewhere? I’m not sure the the problem is the command. I don’t have a breakdown explanation of the command (I doubt that there is a datasheet to use it…) But if I get it I’ll update the post. Yep give it a try. I’m facing a weird situation: I have followed all the steps and I didn’t get any error. I got the sound when I types paplay /tmp/h2g2;ogg on A2DP, but no sound on HSP. Config, RP3 with doss soundbox. This is reported by several people and me too faced it, it comes and lefts with no logical reason. Sorry. Same problem as SouSouleBarbu. I followed all the tutorial, can hear h2G2.ogg, but cannot hear an MP4. When I want to change in Blueman-Manager the audio profile to A2DP Sink, it return “Failed to change profile to a2dp_sink”. But even on Headset Head Unit (HSP/HPF), on my Philips SHB7000 head set, no sound. I am using raspberry pi zero w. with PA 10.0 and Bluez 5.43. I have manage to use my headset in A2DP mode without problem. But when I change to HSP profile no sound heard or mic record. I was able to hear sound and record. But my problem is that the sound is very bad and slow like motion. can anyone help me with relevant hcitool command for this chip? Thank you for the real good work. I only required the A2D2P-support and due to your post it works the first time without sticking around for me. Using Raspberry pi zero w with Riva Turbo X on Raspbian Stretch. I issued the sound beeing slow motion alike, too. Hope to fix it in this weekend. I still don’t get sound on Bluetooth speaker/headset. I do get connected. So can not follow your Tutorial any further..
No card found by this name or index. No card found by this name or index.und by this name or index. any updates about this ? The profile Headset Head Unit is always not available for me, no matter how many time i reset. No updates on my side. If there is any success me or readers will share it. Meanwhile use a dongle to get it work. Ok then is there anyway for pulseaudio to be updated to 11.1 on Raspbian ? If you could share how to do this it would be nice. It seems like they talk about this issue on the patch notes. You can compile PulseAudio from sources, I did it here: http://youness.net/raspberry-pi/bluetooth-headset-raspberry-pi-3-ad2p-hsp, but no guarantee that this will solve your problem. Can you give me the link to the patch that you are talking about please? Those are for 11.0, 11.1 is out atm. Please let me know if you need more help, ill keep probing here. I managed to update to 11.1 Pulseaudio, i will let you know tonight any changes. I have tried with PROFILE=sco with built in bluealsa, same issue. What do you think? Is there a a2dp profile for input ? I think that there is no problem with PukseAudio they already implemented the profiles since many releases, the problem for me is Raspberry Pi Bluetooth instability. I have tried with your steps many times with out any success. i am trying to connect MI bluetooth speaker (http://www.mi.com/in/mi-bluetooth-speaker-basic2-white/) using HSP. not able to set headset_head_unit profile. any kind of help/suggestions will be appreciated. Hello. I performed this configuration on my Raspberry Pi Zero W (with newest updates and upgrades) with two headsets and the result is the same. The record voice is somehow overdriven and digitized – just unrecognizable. So for the one hand it works for me – for the other – no. This has been my experience. I was successful in configuring the RPI3 with a UEBOOM 2 and a MPOW headset and microphone. Unfortunately, the recorded voice is very bad (overdriven and digitized is a good description). Sadly, I probably need to go back to the Bluetooth dongle approach. I am running Wifi and bluetooth at the same time. Another poster mentioned the RPI3 Model B+ may have better performance. The dongle remains the easiest solution for the moment. I did get a chance finally to try this out on a RPI3 Model B+ to see if it would make any difference. I got the same result with poor quality on voice recordings. The Bluetooth dongle approach is still your best bet. Just one other note. i tried this with both Wifi enabled and disabled. The poor sound quality of the recording is identical. They helped me solve my problem were the bluetooth adapter was not showing up in the card list. these instructions could be a little clearer. When killing the bluealsa we need to use the “exit” command to exit the shell or move to another terminal window. If exiting the shell we need to re-enter with “bluetoothctl” and exit again prior to the pacmd list-cards cmd… It lost me for a few minutes. Thinking this could be a good way for me to setup a RPI as an outdoor solar powered bluetooth microphone to pick up nature sounds and then have an inside bluetooth speaker setup to listen to the outdoors. That sounds like a great idea. Check the reachability of Bluetooth if it is enough for you, otherwise you need another mean of transmission. Hey – 1st, thanks – it works. I don’t know about such command sorry, but if I find something I’ll contact you. How did you get it to work?? I followed the entire tutorial, rebooted several times with no luck. I did the same steps as I wrote in the tutorial. If you want an alternative you can buy a Bluetooth-USB dongle. The two commands are equal, I use the card name instead of the index number because it keeps changing after re-connection. I followed your tutorial and tried rebooting repeatedly, i still get the error ,”failed to change profile to headset_head_unit. so thankful for all your work and time man! I just wanna know is there a way to set the audio output to the default jack while keeping the audio input through my bluetooth headset? Yes of course you can do that, using the command pacmd to select default sink and source. thanks for your article, it’s a great work. – all your commands are working (few of them with a reboot like you said). The A2DP part is working, I have sound in my speakers (Suaoki T9S Bluetooth Motorcycle). – when I try the commands for enabling HSP (for microphone if I understand), I haven’t any sound and the command “arecord” use Alsa [Connected to device alsa_output.platform-soc_audio.analog-stereo.monitor (index: 0, suspended: no)]. If i specify a device (with -d) I have a “Stream error: No such entity”. Have you and idea to have both play & record with my headset ? Did you do the command: sudo hcitool cmd “0x3F 0x01C 0x01 0x02 0x00 0x01 0x01” ? With USB dongle…you have to find the driver of this dongle for Linux, not all the time easy if it is an unkonwn brand. Maybe you are lucky and your dongle is already supported by a generic driver in Linux distribution, but the best is to google the dongle to find how to install it in Linux. For example the dongle I used before, I had to create a specific file and copy it in the Raspberry Pi, check this old post http://youness.net/raspberry-pi/bluetooth-headset-raspberry-pi-3-ad2p-hsp to see how I did. Ok, so try to do it without the dongle maybe. Another tip: Don’t trust the GUI sometimes it is not reflecting the real situation, the command line is the real status. Oki thanks. No more luck with the built-in BT, same “errors”. Give me the name of the dongle I’ll check for it later. Sorry but I couldn’t find useful documentation for this brand. I followed all your instructions and able to play and record from bluetooth speaker. Now I trying “OK, Google” as mentioned in https://www.raspberrypi.org/forums/viewtopic.php?t=204865. Now google’s python script is not recognizing the microphone, script is throwing error mic_failure_detector.cc. Need your help in resolving this. /home/pi/AIY-projects-python/src/aiy/_drivers/_led.py:51: RuntimeWarning: This channel is already in use, continuing anyway. Use GPIO.setwarnings(False) to disable warnings. – The AIY is using ALSA as audio manager? If yes, you have to re-route audio sinks and sources between ALSA and PulseAudio that is managing Bluetooth audio. – This should be done in the source code so you will have to modify it there. – Try to find in the code what they mean by Channel 1, is it the default ALSA input? – Last to do, if you know how-to of course, is to try to switch to blue-alsa but I don’t ensure you any result. Youness thanks for the tutorial! Everything was successful and I played the h2g2.ogg successfully. My problem is after I reboot my retropie I cannot get the headphones to connect automatically. Is there a way to connect to registered devices? All I know of is the GUI, but when I select display registered devices or connect to registered devices I get a “Unit sixad.service could not be found” error. I don’t know if it matters but this is a compute module so I’m using a usb bluetooth dongle. This is something lot of people are asking me and I’m sorry I can’t do it for the moment. What I can advise you is to create a script that does the commands you did to set up the audio output. And use some tricks and timeouts to give Bluetooth the time so scan and find the headset. If by any chance I wrote a script I’ll let you know by email. If you are using the latest Raspbian versions, I think that the Bluetooth device is connected to blue-alsa, try to kill it before you use PulseAudio. I also mentioned this in the post. hi ive tryed following your tutorial but its not working the headset is connected and showing up but i cant get any audio output or microphone input. it work well , Great Help !! Maybe because you are using both Bluetooth and Wifi. Hi Youness, Followed your guide and finally got my Bose SLM to stream audio from Rpi. Thank you! I have been following the post for a while as I have been trying to get bluetooth input and output working for a while. After many hours and reinstalls and failed attempts, I took a break. But with the release of the RPi3b+ with the upgraded 4.2Bluetooth I was wondering if you or anyone who has been following your efforts and participating in the thread have found any difference with the new chip. I didn’t check this version yet sorry. thanks for such a wonderful post. i have successfully connected a Bluetooth headset and recorded the audio (used pulse audio). the problem is poor quality of the audio as some of the guys have mentioned. but sound quality is still bad, please guide me what is the issue. they claim it can be used with raspberry pi. please suggest me will it solve the issue ? as disabling wifi during audio recording didn’t helped. The Wifi shall be disabled all the time, not only when recording your voice, because the probelm occurs also while streaming the audio from Raspberry Pi to the headset. I can’t recommend you a specific dongle, all I can say is buy a dongle that someone’s already used with Linux, this is what I did. Thanks for your reply. But i am only recording the audio. After recording is done and audio file is saved, i am enabling wifi to send it to cloud. As I did yes the quality was improved with the dongle. Thanks a lot for the detailed tutorial. I did this 3 times but no luck. It throws ‘Failed to set card profile to ‘headset_head_unit’. My device indeed has a mic and it works with my phone. What exactly did you mean by ‘removed’? Is it required to stop my Bluetooth device before going for second attempt? There is a space in below command. I guess we don’t need that. You’re right the space was an error. I’ve got a Pi 3 b + and am trying to connect a Bluetooth speaker. This speaker works with other devices, I’m running Raspbian Stretch on the Pi. Using bluetoothctl the speaker is both paired and trusted. The problem is the speaker and the Pi do not automatically reconnect when the speaker is turned on. Suggestions? hy dear, how to communicate mobile phone and Bluetooth headset through raspberry pi. please, give me solution. Thanks for sharing this online, I couldn’t get my bluetooth speaker to work before but I followed your instructions and everything worked out exactly as you say so really great work for digging into this stuff, I know from my own experience that it can be a daunting task sometimes to get the most simple things to work as you anticipated because you’re a normal person and just expects at least something to happen as you’d normally do when you connect for example to your phone or tablet, right? Really I can’t thank you enough because you saved me a ton of time figuring it out on my own, which is why I already gave up on getting the sound working, I don’t really need it however I do have a strong urge to always get the most out of everything. Yeah, you’re one of the few good people online I think… Again, 1000x thx! Thanks for your kind words. I did this work for one reason that is saving others time that I wasted on my side, I’m glad you and other people can spend time on things more important than this issue. Everything was OK until I arrived at step ‘pacmd list-cards’. There’s no mention about any kind of Bluetooth soundcard or device there (although I succesfully paired my August WS300 Bluetooth speaker thanks to your instructions). Running everything on a Raspberry Pi 3 B+ with latest update of Raspbian Desktop. Can you perhaps help me? Did you kill the blue-alsa before pairing? I think it takes your soundcard and doesn’t let PulseAudio to use it. How do you know that you successfully pair it? It is in Bluetoothctl? Finally! First of all, huge thanks to Youness! I spent 14 hours setting this all up. Sometimes I had a feeling that I just got lucky when things started to work, but nevertheless, it works now! I’m so satisfied! I guess I had some problems with multiple accounts first (then I just deleted the second account and made all the changes from one account). Actually, nothing worked after I did all as Youness told (At this point I didn’t get any cards to show up when pacmd list-cards) but when I got frustrated and removed the Pulseaudio and installed it again all started to work. (that was the lucky part). Most of the time went to figure out this script to automatically connect my Asus BT400 dongle to a Sony’s portable speaker (with mic). It would have been easy without mic.. So here is the script! 2. Copy, edit (MACs) and save. #Your bluetooth speaker or headset MAC address to all of these. Links to setting up the script. Most of the time went to figure out this script to automatically connect my Asus BT400 dongle to a Sony’s portable speaker (with mic). It would have been easy without mic.. By adding a bt connection command to the start I was able to get the script to work. “#pax11publish -r” is an optional line for pulseaudio start problems. (you may have to execute the script (bluetooth_auto.sh) once (just double click) before booting. Thanks for your great comment, I’ll try my best to test this script. Thank you very much for improving answers about this problem, it is really headache the issue! However, trying to do the A2DP connection, with the command pacmd list-cards no results are shown. The answer of my terminal is: 0 card(s) available. Does it mean that the audio bluetooth which I connect to does not have A2DP card? Please, I need more information! If you don’t see a card with pacmd, it means that pulseaudio doesn’t see, or cannot see the device, it can be a problem of connection, or that another manager is using the device. Did you kill bluealsa first? Did you connect correctly the device and get the status OK? This tutorial is 100% awesome. Thank you for presenting it! Hi Youness.. I have been trying this for 2days… But with failures.. I am using RASPBERRY pi 3 model b+. Does anything changes for that?? I am trying to connect to HBS 730 using pi for voice recognition with SpeechRecognition module.. But failing each time to establish a HSP OR HFP connection.. Awaiting reply.. The “Speech recognition” module is using which manager? If it uses Alsa native API it is normal that things don’t work for you. In order to connect your device with a third-party software, it shall use pulseaudio. I am trying to connect to HSB 730 headset using HSP OR HPF but failing…. Can you kindly help me about this? Also adding to previous post.. I uninstalled bluealsa rather killing it every time..
No I don’t think that this is the problem. I did not kill bluealsa because it said no such process running iirc. If you could help me out that would be great! As a workaround i was trying to install PulseAudio11.1 from git..
remote: Counting objects: 66081, done. remote: Compressing objects: 100% (13523/13523), done. Receiving objects: 100% (66081/66081), 12.46 MiB | 156.00 KiB/s, done. Resolving deltas: 100% (55213/55213), done. Ok, I propose that you start from scratch and do exactly as I did, I mean to be sure that you are not using a bad configuration or that you broke something on Raspbian. After this, do step by step and know exactly what you are doing first. Pair, connect,…etc. Meanwhile I’ll check for this HBS 730 maybe there is specific issue with it. what ‘source’ shall I use? May be I’m annoying you with this but FEEEEELING like hitting my head against the wall…. This is a long time problem and hundreds felt like you. Yeh. Googling it basically returns to your posted solutions.. But that’s not working.. I’m not being able to getting it done..
What do you think? What might the problem!?? I looked for HBS 730, it had Bluetooth 3.0, it supports A2DP and HSP, so far it is not the problem. Now start again and make sure to know each step. My experience is that sometimes we make errors in the process. Try to make A2DP first, can you hear a music with it? Could that be any issue! Though i think may be not.. I dont know…may be a ghost bug..
And you did the specific command “hcitool cmd …” ? Finally, why not using a USB Bluetooth dongle as I did in another post? With anything can you directly connect to my system and check…? I don’t know may be asking for a stupid thing.. But if you get time.. Will it be possible for you? Yes i also did the hcitool command.. Try to buy the same one I used, that’s what I did I order to find the correct procedure and lot of people did it after me too. Im installing TEAMVIEWER on raspberry pi.. can you help please?? I can’t do live help there sorry. ok no probs… thanks by the way..
Did you try to change to profile “off” before changing to HSP? You can see that you have the headset_head_unit profile, and it is available: yes. My headset HBS-730 working fine on Windows and also on android.. I can figure it out,… Why not Raspberry pi..
Now I’ve to check if HSP works..
working on CSR8645.. As my main project would be working on CSR8645..
What headset did you use for the headset mic…? Sink bluez_sink.xx_xx_xx_xx_xx_xx.a2dp_sink does not exist. any idea why i would get that? Followed all the previous steps with no issues. Did you change xx_… with your own MAC address? Ok and can you list the sinks you have? You can try to switch the profile from a2dp to off, and then to hsp. I have a Raspberry Pi 3B+, and a Bluetooth speaker called the ‘SoundCore mini’ mfd by Anker. Unfortunately, Anker does not publish the specifications of this speaker, but during a phone call to Anker’s tech support they informed me the SoundCore mini supports profiles: A2DP, HFP and AVRCP. I operate my RPi in “headless” mode without a GUI. My OS is Raspbian, and it is current. I have installed PulseAudio, and the following packages related to bluetooth are installed : bluez, bluez-firmware, pi-bluetooth. Using the `bluetoothctl` tool, I have been able to identify my SoundCore speaker, and to “pair” with it. However, each time I “connect”, the connection is immediately broken. I have yet to be able to successfully connect and play music through this speaker from the RPi (tho’ it happily plays tunes from my phone). 1. Will your approach allow me to play music with my “built-in” BT hardware (i.e. no BT dongle)? 2. Given the research and hard work you’ve done (very impressive! ), is it your opinion that the BT hardware built into the RPi is lacking in performance and/or specifications. Put another way, would you ever buy a BT dongle that had the same specs and performance as the BT hardware in the RPi? Finally, thank you for the prodigious effort you have put into this. 1- Yes, I have no doubt that Raspberry Pi with A2DP works fine, if you can’t do that, it is just a matter of software configuration, the main issue is when you try to connect your speaker while the PulseAudio session is taken by other source, or it is shut down after some time. I advise you to do a step by step try to figure out why the connection is not permanent.